in the comfort of their lounge rooms. Anyone looking for an exciting and diverse career should tune into channel 4ME (metro 74, regional 64). It’s the place to be on Wednesday 14th May 2014 at 8pm to discover an award-winning career in tourism and hospitality. series of 5 TV episodes hitting TV screens across the country, also available online at 4me.net.au. 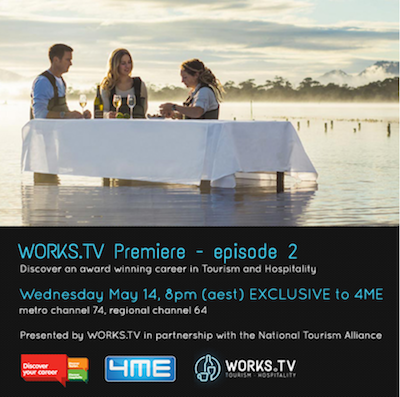 The premier screening of the 2nd episode is tonight, Wednesday, 14th May 2014, highlighting training and careers, highlighting the Skills Pathway program, Ambassadors and the Executive Chefs Club. www.discoveryourcareer.com.au is the home of all things jobs and careers in the tourism and hospitality industry. With just a few clicks, visitors will be navigating their way through the many possible careers in these areas. There are thousands of jobs available in the second fastest growing industry in Australia, so discover your career on TV and online.